Why Be Curious? Freisa is Nebbiolo’s rustic parent, and in parts of Piemonte was once prized even more highly than its upstart offspring. Scarpa’s version shows that Freisa can improve with age almost as long and as interestingly as Nebbiolo. Il Vino / The Wine: A serious, structured Freisa that will delight Nebbiolo lovers. In good vintages, it improves with age for at least a decade after vintage. 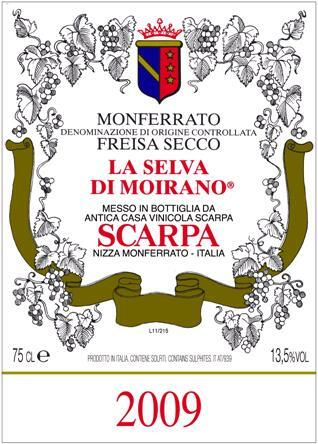 A Tavola… / At the Table… Scarpa’s Freisa has the structure of good Nebbiolo, so use it in the same way. Vitigni / Varieties: 100% Freisa. Gradazione alcolica / Alcoholic %: 12.5-13.5%.